30TH MAY 1915. FRIENDLY FIRE & FAVOURITE FOOD. 22nd May, Sat: N. M. Farm 10 A.R. and 10A support shelled. CASUALTY: 8533 Pte H. Rochford (wounded?). 23th May, Sun: 50 yards of enemy parapet blew up on our left. Artillery on both sides very active. Inaccuracy of our supporting Battery reported to 1st Brigade RFA (1) & 137th Inf. Bde. 24th May, Mon: Enemy shelled Trenches 8 (Bertie’s), 9A, 9B, 10B and 10B (support) damaging parapets and traverses. Inaccuracy of our own supporting battery again reported. Relieved by 6th Souths about 11.20 pm. ‘A’ Coy (Bertie’s) remaining in support. CASUALTY: 7787 Pte (Dr) A. Fitzer (2) slightly wounded. 25th May, Tue: In Hutments, Bulford Camp. (‘A’ Coy supporting 6th South). 26th May, Wed: ‘B Coy relieved ‘A’ Coy in support. 27th May, Thur: In Hutments, Bulford Camp. 28th May, Fri: Proceeding to trenches in relief of 6th Souths at 8.15 pm. CASUALTY:7251 Sgt B. Stephens wounded. 29th May, Sat: Wulverghem. Enemy shelled 9C, otherwise quiet day. 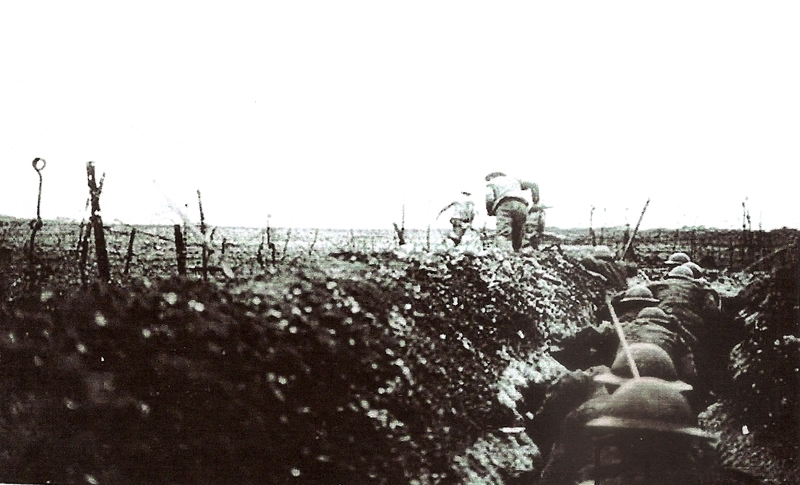 ‘C’ Coy, 8th R. Brigade (3) attached for instruction in Trench duties. 30th May, Sun: Very quiet day. 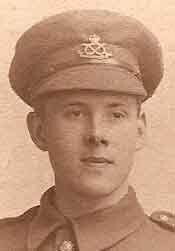 CASUALTY: No 9218 Pte E. Hayes wounded. Sap Trench into No Man’s Land. Soldiers had to bend their backs before ‘going over the top’. A.H.H. Own War Diary: A Little Book of Words & Doings‘. ‘Trinity Sunday. 30th May 1915. New sap (4). Picket duty in the rye in front (5). Found good souvenir of nose of shell. Read Revelation’ (6) . Pte BERTIE HIBBETT: LETTER to Mother, Marie Neal Hibbett, 95, Foden Rd. Walsall. A lovely sunny afternoon again with a cool breeze. I am with Vernon & one Cecil Jackson*, a bank clerk in the United Counties (7). I can picture ‘mysel’ coming away from Sunday School for it is after 4. 0’ clock. Yes we all miss Lieut P.* both officers and men (9). He was our Captain’s right hand man & before you told me he was a clergyman’s son he put me in mind of the Rev. E.M. Darling* in his manner, stature & many other characteristics. 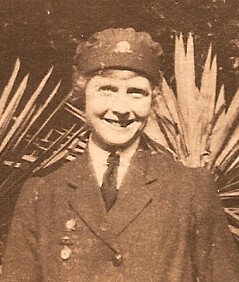 Mother : Marie Neal Hibbett, Abergele. August 1914. Watercolour. Arthur H. Hibbett. Aged 19. You must go on the usual procedure for the Summer holidays (10). I’m sure you will need a rest and Father too. I wish I could say more on the matter but I’m afraid this letter won’t go in the green envelope now I’ve put something in about the army (11). Basil will enjoy hay-making with Les (12). I heard from Allen*, with whom I had a long chat on Thursday evening, that Tom (Ser) is not well, got something the matter with his leg & injured his left hand. He’s as bad as if he were out here I’ll be blowed. I was on duty as a picket this morning & had to lie in the long tall rye, the sun beating upon my neck. 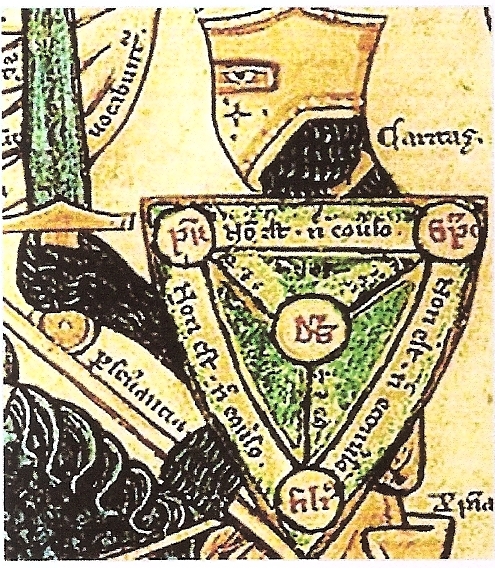 Shield of the Trinity. Creed of St Athanasius. I pictured you in St Paul’s singing the Creed of St Athanasius (13) & I guess you will perhaps go to Rushall Church (14) for an evening walk as well as to the service, if the weather is like it is here. We have had orders to do away with pants & I shall be sorry if you have sent some off to Syd before you heard from me. The weather is so hot that I am without vest & tunic. I had a lovely wash with a tablet of oatmeal Mrs Hurst* sent me, another generous lady. Should you get this letter before you buy or send a pipe then, Mother, as you do not care for a ‘man’ to smoke a pipe don’t go to the expense of getting one, but if you have already taken steps then send the pipe. I enclose an extract from Harold’s letter I got the time we were in the trenches the Sat before Syd’s birthday. We relish the following – & Oh dear Mother, it is so kind of you to say it is a pleasure to you to think out what to send us in parcels – Lemon curd, I tin of Cafe -au- lait, I tin Pineapple with tin cream, Bird’s Lemonade with sugar or 1 bottle of Symington’s Lemonade crystals, 1 loaf currant bread, tea cakes. I for my part like caraway seed in them and occasionally could you put a cake in? Although we’ve had 3 cakes Syd couldn’t keep them so long & besides he gave a slice all round the hut with his usual generous manner. (I helped him). A cake makes the parcel complete, but see that it’s packed well (of course forgive me just saying so for you always send a well packed parcel). We could do with some sugar to go with the Lemonade or Cocoa and the Cafe au lait needs a little; also if you send any currant bread, or tea cakes, butter would be a great welcome. Many thanks for the last lot of butter & bread which we greatly appreciated. Now I’ve said my say with regard to Parcels I can’t help but feel ashamed of my greediness. Now make a nice Sunday tea. 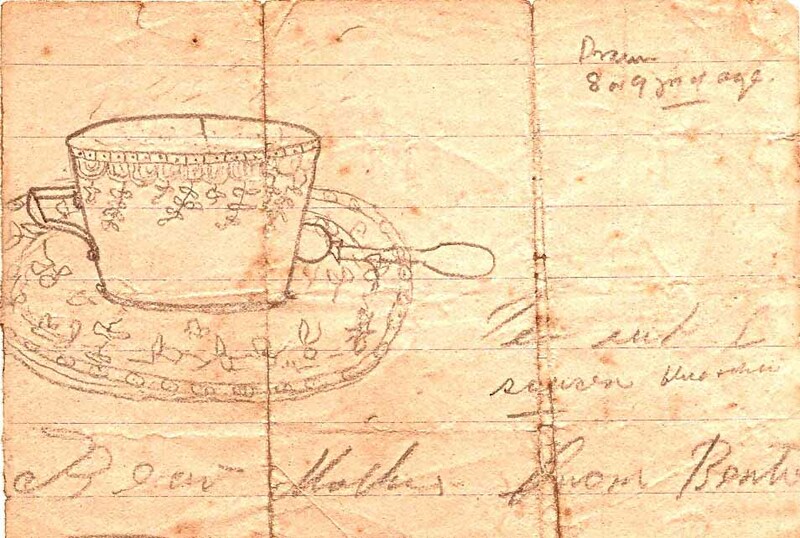 TEA CUP & SAUCER blue pattern for ‘Dear Mother from Bertie’: Drawing by Bertie Hibbett. Aged 8 or 9. Goodbye for the present. I pray that Mother will have a quiet, goodnight’s sleep. (5) Picket Duty: Sentry Duty (to warn of enemy advance –fully armed in pairs, 2 hrs) . Pte Bertie Hibbett appears to be out of the sap in No Man’s Land with only the rye for protection. (6) Book of Revelation: the only Book of Prophecy in New Testament. An Apocalyptic Vision of a New Heaven & a New Earth. (7) United Counties Bank, Wolverhampton. 1907 -1916 when acquired by Barclay’s Bank, together with Birmingham District, Counties Bank & Bradford Old Bank. See Lives of the First World War <https://www.archive.barclays.com&gt; . (8) Rifle Brigade. http://www.1914-1918. The Long Long Trail. Another indication that QMS 1/5th S.Staffs differentiated themselves from Kitchener’s New Army? (9) Lieut. Parr* compared with the Revd. E. More Darling*, Vicar of Walsall. His‘A’ Coy. Captain was Captain Cecil Lister DSO*. 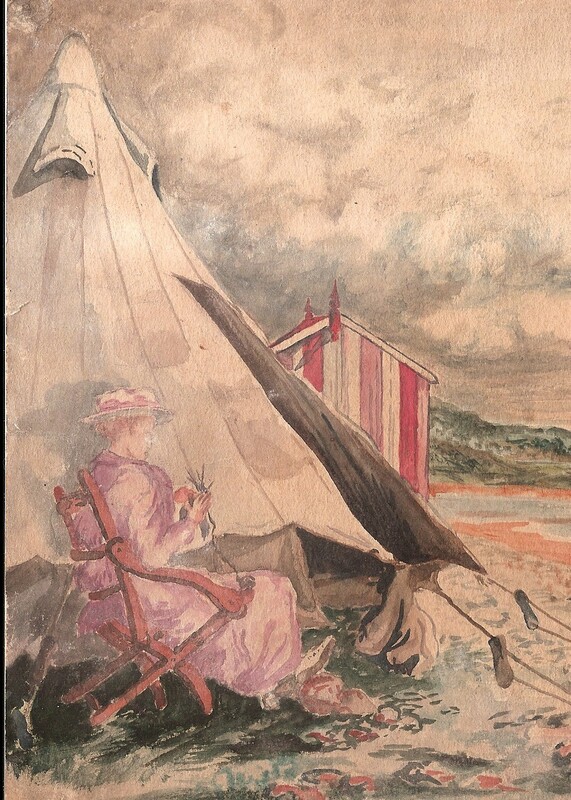 (10) Family Summer Holidays alternated between Abergele, Wales and Whitby, Yorkshire. (11) Green Envelope: First issued April 1915. Soldiers were on their honour to write only personal matters. (12) Les & Tom Ser. ref. to Staffordshire farm where Basil (future agricultural engineer) helped out at weekends & holidays? (13) Athanasian Creed: (Latin: Quicunque Vult). Book of Common Prayer, 1662. Summary of Christian Doctrine of Trinity & Christology, to counter heresies re Nature of God. [Traditional authorship St Athanasius, 296-373 AD, Archbishop of Alexandria, now questioned. Used in Western worship since 6th Cent. on Trinity Sunday & other festivals. Rarely used today] . (14) Rushall Church, Walsall, where Ida Hibbett is buried & Sgt. Sydney Hibbett is commemorated (a mile from 95, Foden Rd, Walsall). NEXT POST: 3rd June 1915. Update Welcome. Athanasian Creed.Express & Star Martin's Cigarettes.Food ParcelsGreen Envelope.Kitchener's Army.Kitchener's Cigarettes.Picket Duty.Revelation.Rifle Brigade.Royal Field Artillery.Rushall ChurchSap Trench.Shield of the Trinity.United Counties Bank Wolverhampton.Wulverghem Trench 8. 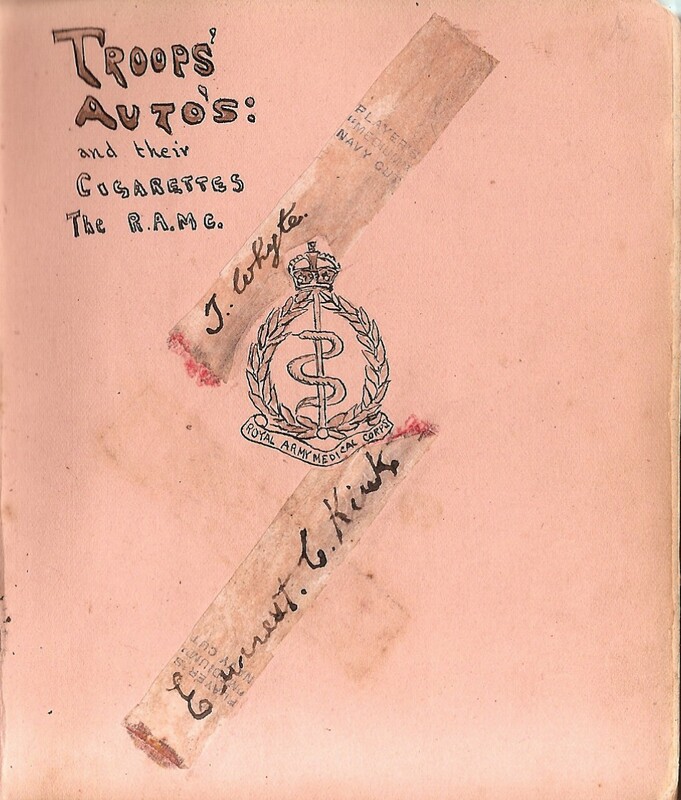 21ST MAY 1915: ‘ALL ABOUT SMOKING’ – TROOPS AUTOS & THEIR CIGARETTES. 18th May 1915, Tue: ‘D’ Coy proceeded to relieve ‘C’ Coy. CASUALTY: KILLED: 9998 Pte Swancott ‘C’ Coy. 19th May Wed: ‘C’ Coy inspected by Bdr Gen. Feetham. 20th May,Thur: Proceeded to the trenches in relief of 6th Souths at 9.0 pm. CASUALTIES: WOUNDED: 9899 Pte A.D.Wood 7855 L/C J. Bird (slightly wounded); 6108 Sgt E. Lloyd. 21st May, Fri: Enemy burst seven shells over 9A support. Otherwise quiet day. CASUALTY: WOUNDED: 8707 Pte J. G. Bennett. Pte BERTIE HIBBETT: LETTER to Arthur & Marie Neal HIBBETT, 95 Foden Rd, Walsall. To begin with dear Mother you were the Ist to convey the news of our letters being ‘in the paper’. I mentioned the fact to Norman Cope & Cyril Hinde who are in the same hut in camp. Norman was puzzled, he could not remember writing a letter which would be likely to appear in any paper & we all three could not think of the paper it could be in. I thought of the Advertiser, Syd of the Birmingham Mail. Maurice Badian Esq. Medellin, Republic de Columbia, U.S.A.
‘An Explanation & A Request. The smokes in this parcel have been subscribed by the United States, as a testimony of their kindly feelings towards the cause of the Allies. 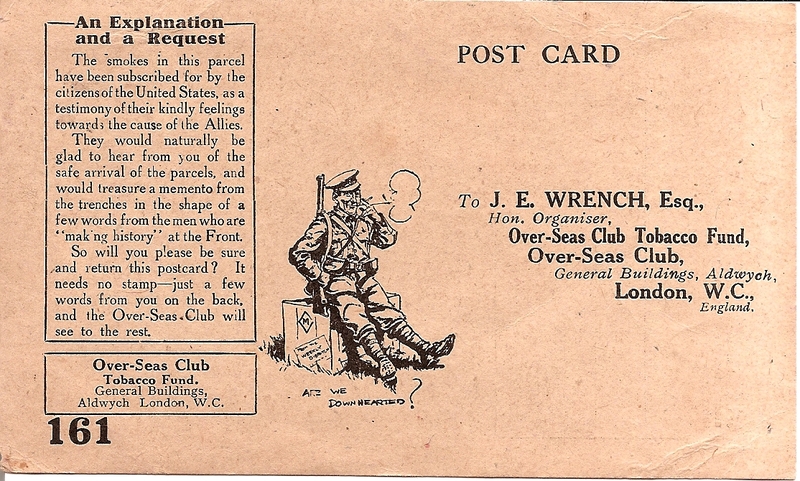 They would naturally be glad to hear from you of the safe arrival of the parcels, and would treasure a momento from the trenches, in the shape of a few words from the men ‘who are making history’ at the Front.’ Over-Seas Club, Tobacco Fund, General Buildings, Aldwych, London W.C.
* * * * * * * * * * Have you had my letter written on his coming of age? another racking of my brains for a real Birthday one. If you did I guess, or rather I am wondering greatly, what sort of opinions Mother & Father will have of me for smoking Syd’s health. Well I have not yet smoked a cigarette & I know Dad prefers apipe. 1) THE QUEEN’S WESTMINSTER. 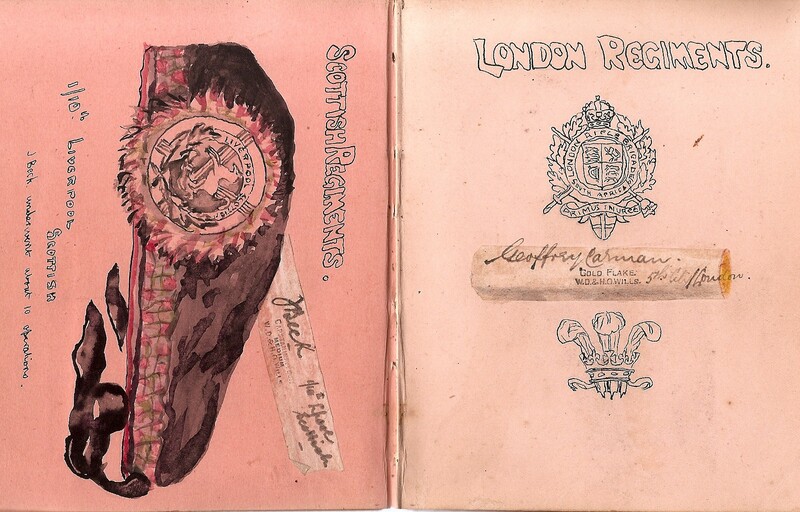 South Africa 1900 -1902.. Pte Bertie Hibbett’s Autograph Album 1916 – 1917. The Cenacle, Red Cross Hospital, New Brighton, Birkenhead.. I shall have to be a smoker now. Miss Foster has ‘done it in’ for me. Fancy, she addressed the parcel to me & not to Syd. Of course the contents were for us both. Guess? – why Country Life cigs with a nice letter enclosed. Miss Foster seems to be puzzled with regard to our ‘diggings’ – she had an idea we lived in houses. Now look here Mum, what can you make of Mrs Jones, isn’t she TOO BAD. Why another couple of tins of Embassy & two more of Nestles. I gave Syd a good share of one box. Vernon, Oh Vernon – now I have smoked a pipe on Syd’s 21st, has jokingly pestered me to smoke one of his cigs. After tea he sais a smoke is most soothing, and at the rest, on a march when my head ached, he said a cigarette would put me all right. 2) SCOTTISH REGIMENTS: 1/10th Liverpool Scottish. ‘J. Beck underwent almost 10 operations’. AHH Autograph Album, The Cenacle, Red Cross Hospital, New Brighton. 1916 -1917. 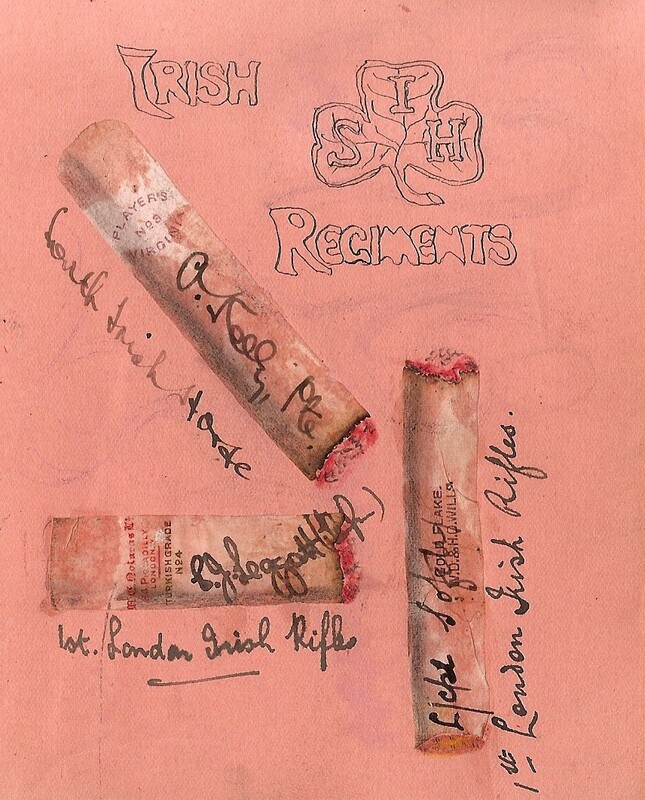 3) IRISH REGIMENTS: Cigarette Paper Autographs. Pte Bertie Hibbett’s Autograph Album, The Cenacle, Red Cross Hospital, New Brighton, Birkenhead. 1916 – 1917. Vernon’s sister has sent him some lovely shortcake biscuits & a few currant cakes & some toffee all of her make & he was very generous in letting Syd & me sample some. Your letter Mother written on Syd’s birthday was ripping, long & of course most Motherly. I often picture you in Church alone. Couldn’t Dodger go with you some Sunday evenings now summer is coming? Talking about Nature which goes on as usual – the war only affecting man’s work such as houses etc – on going & coming to & from from the trenches we often hear the Frogs croaking. There must, I should think, be an innumerable number of the songsters all along the fields, especially around the stagnant ponds. Send some lilies, as Ida promised, – the garden will be lovely if all goes on well, considering what Basil said in his past letter. If you don’t get a letter for some long time after it was written you will know it was written in the trenches where there is no outward post until we get back to Camp. I guess Basil will tell you when we are coming out of the trenches & the day we are going into them. Go to Camp next Monday night. 4) R.A.M.C Autogrphed Cigarette Papers. Pte BertieRed Cross Hospital. 1916. I promised Vernon I shall not smoke again until I hear what you & Dad have to say on the matter. We have had wet weather in Camp, but today, as I am writing this, the sun is scorching & I shall have to close now as I am getting sweaty. I expect a letter from Harold tomorrow, for he said he was writing to me. So Fred York* called did he? – well I wrote to him & Harold on the 6th when I wrote those letters you were anxious about, namely acknowledging the good parcels. It is not very often that I miss (filling) a page, but I am getting exhausted of reliable news. It was very kind & considerate of you to visit Bailey’s mother*. Best love, Bertram. Censor W.E. Wright. Pte BERTIE HIBBETT’S Autograph Album. Signatures collected at The Cenacle, British Red Cross Hospital, New Brighton, Birkenhead. 1916 – 1917. 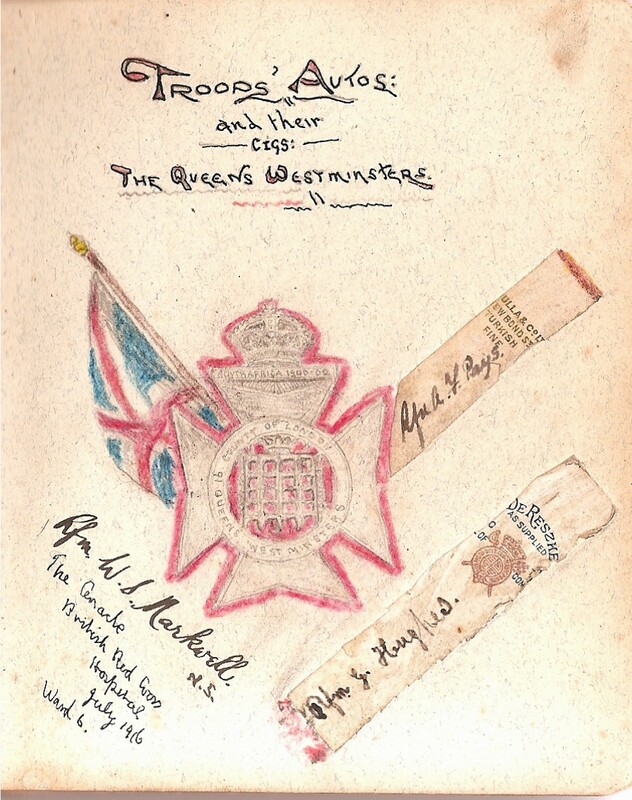 Troops Autos & their Cigarettes: 1) The Queen’s Westminster. July 1916. Ward 6. 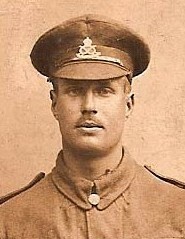 Rifleman G.Hughes, De Reszhe as supplied. Rflm A.J. Bays, Abdullah & Co. Ltd. EW Bond Street. Turkish Fine. 2) Scottish Regiments: J. Beck 1/10th Liverpool Scottish. Capstan & Navy Cut. Medium. W.D. & H.D. Wills. ‘J. Beck underwent almost 10 operations’. 3) Irish Regiments. 1st London Irish Rifles. A. Kelly Pte. South Irish Horse, Players No 3 Virginia; E.J. Leggett, Rifleman. R.E. Notasa(?) Ltd. Picadilly, London. Turkish Grade No 4; L/Corpl. Sofetig (?) Gold Flake, W.D. & H.D. Wills. 4) R.A.M.C. (Royal Army Medical Corps). J. Whyte. Players ‘Medium’ Navy Cut. Ernest C. Kirk (ditto). NEXT POST: 30th May 1915. 1st London Irish Rifles.1st Middlesex Regt.Abdullah & Co Ltd 158 New Bond St.Cigarettes: Country Life.Cigarettes: Kitchener's/ Roll Call.Food ParcelsGold Flake WD & HD Wills.Murattis Au Bon Fumeur No 3B.Nature/ Frogs in the Trenches.Over-Seas Club Tobacco Fund.Players 'Medium' Navy Cut.R.A.M.C.Tobacco: Embassy/ Nestles.Tobacco: Matin's 'Arf a Mo'/Walsall Papers Express & Star/Advertiser/ Birmingham Mail. 17TH MAY 1915: COMING OF AGE IN THE TRENCHES. 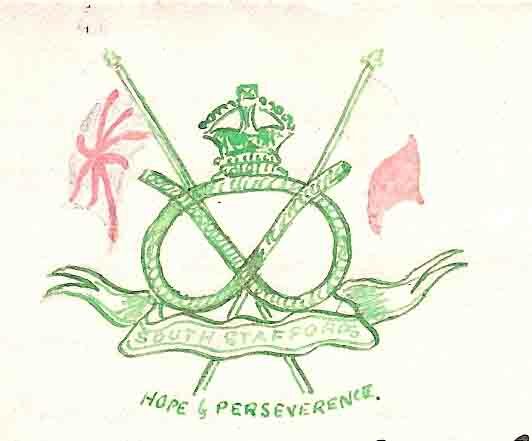 17th May, Mon: ‘C’Coy remained behind in support of 6th South. Pte BERTIE HIBBETT: LETTER to MOTHER & FATHER. (13 pages). Message on outside ‘Open with care – pressed flowers‘. (NB Flowers cut out by his Mother 1915, ‘replaced’ by EFW 2015). Sydney’s Coming of age – to think of it – there seems to be a beautiful atmospheric effect. Although far apart Mother & Son are joined heart to heart. I pictured you all singing that on Sunday. I read the Psalms, both for Matins & Evensong (3). Sunday seemed more like Syd’s birthday, for we received your extremely welcome parcels – guess what time? -why after ‘Stand To‘ about 4. in the morning – when Mother and all of you are fast asleep. The day too turned out lovely, bright & sunny. My generous brother shared his birthday parcel at tea-time & the Listening Party had a most enjoyable tea in the evening sun. Sydney, the very name of strength, courage & gentlemanliness. Mother dear, you will be all the more delighted to know that Syd is favoured by the Listeners above any other NCO for duty with the party. Norman Cope* was quite anxious to know if Syd was the NCO to take us out one night. The Lance Corporals take it in turn to go with the Listeners. Syd came with us twice. How unique it would have been if Syd had been with us on Listening post & seen the dawn of his 21st birthday, but such was not to be. Syd was never taken to drama & sentiment of that kind; an ordinary ‘common or garden day’ is his choice. I sometimes have the idea that Syd was made for a soldier – tall & broad of stature. I shall not forget the day he went Home for 24 hour leave. That day we were on guard at the Post Office in Saffron Walden – the time came when it was my turn to take my beat in front of the Post Office during the day when there were many people, both civilians and soldiers passing. The Sergeant of the Guard (a very kind & genuine man, who had the faith & pluck to say prayers in the hearing of 2 or 3 Companies of the Battalion billeted for the night) – the Sergeant requested that, for the improvement of the reputation of the Battalion Syd should take my place. Although it had snowed the night before, Syd’s bayonet was as bright as ever, his pack was as neat as neat could be & in fact his general appearance was smart. Away he went & began his beat. My tall & broadly built brother, pacing up & down, was an honour to the Guard. I have an idea that the next morning, at rifle inspection, our Platoon Commander lifted Syd’s bayonet on high & showed it to the Platoon as an example. I may add that Vernon at tea on Sunday showed me his bayonet & said his effort at keeping it clean was through Sydney’s example. Vernon was not a Listener. Sid had a little tea with the Listeners, then we invited Vernon to Sid’s hut & had a quiet & enjoyable tea together. Vernon brought some whipped cream & we had it with the apricots. He did enjoy the whole of the tea, especially the lemon curd. Syd cut a slice of cake for him & he relished the whole lot & he could not resist one of Ida’s chocolate biscuits, which Sid & I think are lovely. All the Listeners who ‘partook’ of dear Mother’s homemade lemon curd absolutely relished it. We fortunately had a ration of butter & Norman Cope had a lovely loaf sent him. As for the tea, or rather drinkables, Sid & I enjoyed a mess tin full of tea made with the tea you sent. Arthur Brown* or Brewin as we call him (who is also very generous) made coffee & cocoa. Vernon jokingly suggested that I ought to smoke Syd’s health & he offered me a cigarette. Oh Mother, I have tried hard to tell you in the best & most fluent way I can, but I conclude it is a failure. We spent a really happy Sunday – till up to night time when Norman & one or two Listeners expressed their disappointment at Syd not coming out with us on Listening Post. – – Just got a parcel (the postmark looks like Redditch & the writing like one of the Overends*). Syd got Auntie’s parcel containing two pocket handkerchiefs & a couple of bananas in a card board box. Marvellous – absolute marvel! – the cake was not all broken. Generally all that’s left of a cake sent in a cardboard box is a bag of crumbs, squashed completely. We shall enjoy Auntie’s cake for they are always nice & fruity. We have not yet finished the birthday gifts from home. There are the Pineapple chunks which we shall share with Vernon & his cream. – – Another parcel & a letter for me & a parcel for Syd. So that makes 3 parcels & a letter come since I started this letter – coming like the – no I won’t say – those horrible things that never stop coming – only the opposite kind. Let me finish my blank verse. 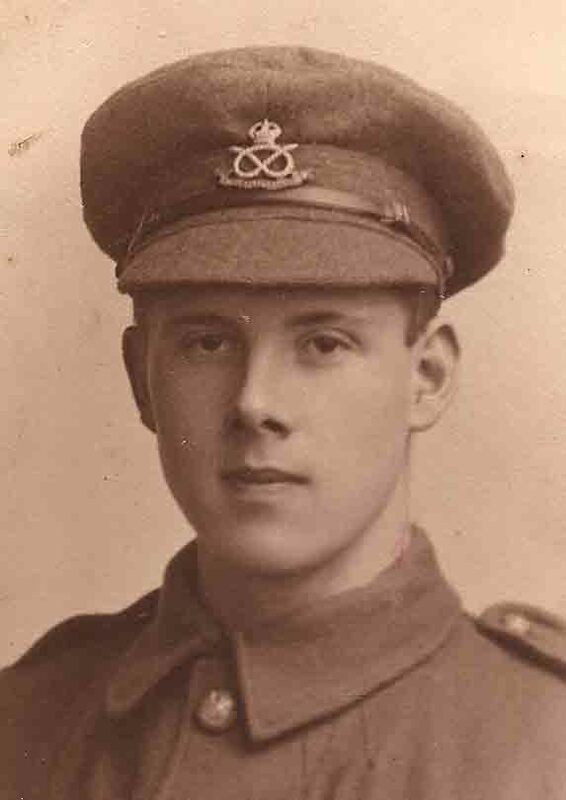 Syd, I conclude could not have had a happier time than spending his 21st serving his King & Country & helping to do his little bit to guard his dear home to which he said sincerely he would like to be there now. NB I have just read the letter from you, dated May 15th. Now I am certain I wrote to you acknowledging the ripping parcel of fruit, chocolate, Velma coffee au lait & Ida’s tea cakes were lovely. I wrote to Harold & Fred York. I cannot very well repeat the letter but it was one I especially wanted you to keep for it was written when the trench was being shelled. I did not say anything closely referring to the incident. Is that the 1st letter you have missed receiving? I have often thought of telling you to state the date my letters were sent to you & just refer to something I said so that I can tell what & everything about the letter sent. Yes I’m certain I wrote & am awfully sorry dear, dear Mother, but you mustn’t expect that everything runs smoothly always. I do not feel like writing many letters, but I trust that if Harold does not hear from me you will say that I wrote & will write him as soon as possible. I’m sorry Syd did not write. Didn’t you even get a field PC? The letter might have got buried like the Malted Milk tablets. I say just carefully read through all my letters written after May 6th – the day we had the excitement. I have had an idea there has been one or two or more letters you have not received – do write a PC straight away. I also wrote, by the by, a letter to Mrs Jones* the same day. Twilight in the hut. Vernon especially told me to mention in this letter how very much he enjoyed the things we gave him for tea today. Syd cut into May Overend’s handmade cake & handed a piece all round the hut. Vernon had a slice of Auntie’s cake & some pears from Mrs Machin*. He also told me to be sure to thank you for the box of Rowntrees chocolate. This letter is getting long for the censor but I must tell of THE thing for Syd’s 21st. I smoked his health. I want Dad to know of the ceremony. You remember me mentioning in a past letter that Brewin had a spare army issue pipe, he had smoked it a little so he gave it to me. I have had it in my haversack for quite a long time & brought it out this evening. Well – Vernon supplied the bacca, a good bacca – Boardman’s – & filled it for me. Then Syd lit the pipe for me while I drew; after some awkwardness I managed to smoke it fluently. There I lay stretched out in the hut by Syd & wished him Many Happy Returns & Good Luck. Everyone was humorously surprised. Some suggested that I should have had a cig to start with, but I thought Dad would rather have me smoke a pipe to begin with – Dad having not smoked a cig in his life. I will now close, but I must say that generally we have Church Parade on Monday & it would have been still happier if Syd & I could have attended Holy Communion. I have just read a verse out of Psalm 89 for the 17th evening, verse 25:- My truth also and my mercy shall be with him, And in my name shall he be exalted. May Syd spend his next birthday in England & be there before his 22nd year is out! Six Parcels for Syd; 2 from Home; I from Harold, (which he was anxious about Syd getting on the 17th & Syd did – a lovely cig. case); I from Overlands, absolutely ripping; 2 tins of coffee au lait; I packet Russian cigs; I tin of sardines; 2 packets of BlackCat ? with Dict –(unreadable); 2 tablets of soap; 2 packets of Peters Choc. ; 1 packet of Bournville choc. ; 2 pencils, one in case; A large slab of May’s homemade caramel toffee; I large handmade cake; I parcel from Mrs Machin* containing tin of pears; I tin of toffee. I tin of Gold Flake; 4 apples etc. 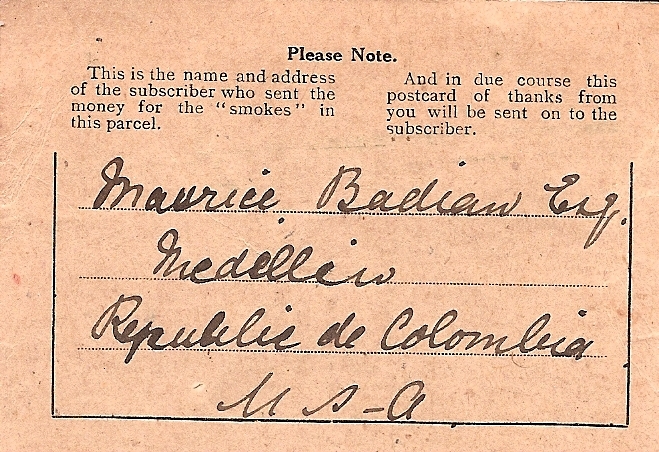 ; 2 boxes of State Express from Miss Bore*. letter from Miss Foster* & Parcel following. See Over . . . anything else to say? – the censor is my dread. Again IT IS WORTH REPEATING the lemon curd is lovely & Syd is enjoying it, send some more Choc biscuits next time Ida. & Dad I should like your opinion on my smoking. What a ripping lot of letters. Vernon did enjoy the tea in the dugout this afternoon. Plenty of little souvenirs for you, make fine brooches. I could have captured a man one night. Now to Syd – For he’s a Jolly Good Fellow. God save the King. Typically, Bertie’s thoughts are all of his Mother & of Sydney, as he tries to reassure his parents that Sydney’s 21st Birthday was a happy one, and their food parcels and gifts were a resounding success. His proud description of his brother tells a great deal about the difference in their character & physique. Apart from the smoking ‘ceremony’ Bertie says hardly a word about himself except cryptically – out of the blue – ‘I could have captured a man one night‘. As a child, I once asked my father how many people he had killed in the War and he answered, surprisingly to me & with a strange look on his face, that he might have killed one man. However the shell-shock, that must have begun during this 2nd Battle for Ypres, lasted all his life. (1) Seige & Relief of Mafeking, South Africa. Boer War. Lord Baden Powell with 1,100 troops & Cadet Force of Boys,(12-15 yrs old) defended Mafeking for 217 days, Oct.1899 – May 1900. Baden-Powell became the nation’s hero & my father helped the Boy’s Scouts when a curate at Alford, Lincolnshire. (2) Psalm 85.10. (3) Psalms 78-85 Book of Common Prayer.1662. (4) ref. no doubt to the constant noise of shelling & the death of Lt H. Parr. (5) Hymn: Through the night of doubt & sorrow’. Bernhardt, 1826. (trans.from Danish by S. Baring Gould). NEXT POST: 21st May 1915: All About Smoking. 21st Birthday Parcels to the Front.2nd Battle of Ypres.Baden-Powell.Bayonet cleaning.Boardman's tobacco.Boy Scouts.Church Parade.Forget-me-nots.Horlicks Malted Milk Tablets.Post Office Saffron Walden.Psalms.Rowntrees chocolateSeige of Mafeking.Shell Shock.SmokingState Express & Gold Flake tobacco. 16TH MAY 1915. 21st BIRTHDAY PARCELS TO THE FRONT. 15th May 1915, Sat: North Midland Farm shelled. A Fuse struck the Aid Post penetrating the wall. CASUALTIES: WOUNDED: Pte H.G. Ball. KILLED: Lt H.W.M. Parr* (1). 16th May, Sun: Very Quiet Day. WOUNDED: 2 Lt S.P. Smith and 8831 Pte J. A. Boulton. Relieved 1/6th South. Pte BERTIE HIBBETT: ‘A Little Book of Words & Doings‘. May 16th. Sunday. Fine spread with Listening Post at tea. Lemon curd, cakes, tinned fruit etc. Vic Shaw*, Iky Boulton* and Norman Cope* with his loaf from home. Sunny bright weather. After tea with Listening Post, Sydney, who was then Lance Corporal, had tea with Corporal Hammond & Vernon, who arrived late. Choc biscuits & tinned pears. Vernon brought his cream. Hammond requested me to smoke Syd’s health, but I waited till – 17th May. Pte BERTIE HIBBETT: POSTCRIPT of LETTER to Brother BASIL, 14th May 1915. which he says he has included in Letter to Sister Ida. (Censor WE Wright. Post stamped 5 days later). PS Syd & I got the birthday parcels which again arrived in spiffin’ condition. Oh how can I express the gratefulness I feel on seeing not only the many good things but reading such jolly letters, which I am certain you all individually made a special effort. Dad’s wittily made up note of good wishes was as good as any long letter. As for Mother’s, hers were the ones. I cannot express the thought which is in mind at present – but Syd & Mother seem both in one now – our thoughts are of his birthday. We got a nice letter from Auntie*, who said you had written to her of late. I think her parcel will just arrive on the day, 17th. (I’m sorry you did not get the letter in time to read my proposed date for sending the parcel. I said 13th or 14th I believe ) (2). The weather has been rather chilly & changeable, but it is warm & sunny at present. In my next letter I will tell you about another successful attempt at making my favourite bread & butter pudding. Mother will, I know, be especially interested, for she wanted to know how our chums were & she knows how I like the above named pudding. I must stop now, I could go on for ever & I see the pencil seconds it , I don’t think! Best love to all, Bertram. (1) Lt. H. Parr* one of Bertie Hibbett’s favourite officers. cf Post NB Keeping the Names Page up to date with refs in Letters is proving difficult. (2) Getting Birthday Presents & Letters ‘on the right‘ (day) was important to the Hibbett family. (3) Pineapple chunks. NEXT POST: 17th May, 1915. Coming of Age in the Trenches. 21st Birthday Food Parcels.Bertie's Bread & Butter Pudding.North Midland Farm First Aid Post..SmokingWulverghem Listening Post. 14TH MAY 1915. WULVERGHEM LISTENER’S LOUNGE OR ‘ARKNERZUT’. 12th May,1915, Wed. Proceeded to Trenches in relief of 6th Souths. 13th May, Thur. Saxons reported opposite our Sector. They got on the parapet and attempted friendly overtures. ‘A’ Coy opened fire on them hitting two. CASUALTIES: KILLED 9168 Pte G. A. Slates, WOUNDED: 8781 Pte S. Mold and 8219 Pte J. Pearce. 14th May, Fri: Abnormally quiet day. KILLED No. 1050 Pte W. B. Share. Pte BERTIE HIBBETT: LETTER to BASIL, 95, Foden Rd. Walsall. I am one of the six Volunteers who ‘go out a’noit a list’nun for un ’un’ (3). My word and I shan’t half have something to say of our fine experience on this dooty when I get home. 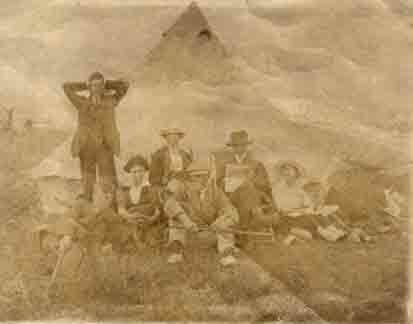 The Wolverhampton lot had half rigged up a dugout for the exclusive use of the Listeners. So Iky, the Observer Man, and ‘all on us’ have improved the place & Iky, after ‘all on us’ had racked our brains for a ‘door plate’, began in ‘block type’ with a pencil & deftly printed the name of the hut above. We are sometimes called the Hearkeners & one suggestion for a name was The Hearkeners’ Hut, but Iky said no, some of the men will be calling it the ‘Arknerzut’. Unfortunately it rained practically all day the 1st day, but luckily there was very little rain as we lay down by the corn ‘a listen of’. Another handsome parcel arrived for Syd & me from Miss K.E.B. (4). So I enjoyed a ripping cup of cocoa- au- lait, or cocoa made with milk. There was a lovely tablet of sweet-scented soap each. I had ‘cool cream & glycerine’, Syd had ”buttermilk’. Miss K.B. used a lot of mint toffees to pack the parcel & on the bottom was laid two packets of Cadbury Mexican. Five of the Hearkeners are cracking jokes now. Arthur Brewin* as we call him, is one, Iky another, Norman Cope* another, Vic Shaw* (who gained honours at the Gram: school in Oxford Senior) & I make up the 5th. ‘After you with the marmalade’ – ‘Have a drink of cocoa au lait’. Syd was the N.C.O. who took us out last night (5) – they all like him tell Mother. (Mother, by the by, said she would like to hear more about the boys with us). This smear is just a little of the cocoa. We are quite used to what-you-might-call difficult circumstances with regard to dining; we manage fairly well to partake of a slice of bread & jam seated in The Lounge. I was so interested in yours and Mother’s account of the poor little thrush. Nature goes on as usual. We can hear the cuckoo amidst the burst of shot & shell during Stand To (6). Iky knows I’m writing, he has just asked me if I am mentioning him & if I have yet told you about eating a Marconocy (sic) (7) out of the same mess tin like the Eastern people do. There you have again a good example of adapting ourselves to odd circumstances. This Iky is a ‘rare run’. I’ll conclude with one of his remarks when he caught Syd & me talking about his 21st birthday – ‘Th’arknery will have a fine time a Mundy’. Sid, by-the-way, had some cigs from Miss Bore. Tell Ida we are near that place. Good luck & best love to all. Bertram. PS. May 16th. Got Parcels. See PS in letter to Ida. (1) Ember Day, (Days of Fasting & Prayer for the Ordination of Clergy & to thank God for the gifts of Nature in each season. From Latin Quatuor Tempora (four times). Hebrew Bible Psalm 65.4. Pte Bertie Hibbett was already thinking of a vocation to the priesthood. (2) Naming of Listening Posts & Dugouts was a way of adapting to ‘difficult circumstances’ of Trench Life. (3) My father loved accents & dialect. The transliteration in this letter is probably a mixture of Lancashire & Black Country accent. Translation in order of appearance:- ‘who go out at night listening for a Hun‘ (a German); ‘all of us’; ‘a rare one’; ‘The Hearkeners will have a fine time on Monday’. NB My brother remembers our Grandmother’s voice had a ‘tinge of Lancashire’ and the following Cheer repeated in fun must have come down from her:- ‘ere’s t’us, all on us, may us nivver want nowt, n’ me neither, ‘nif y’do owt for nowt do it for thee sen’. Meaning: ‘Here’s to us, all of us. May we never want for anything, nor me either, and if you do something for nothing do it for yourself!’ The exact opposite of the Christian ethic! (8) Symington’s Pea Flour. William Symington, a Scot, founded a Company at Market Harborough, Leicestershire.in 1827 specialising in dried foods. Pea Flour was invented in 1852 & supplied to troops in Crimea & Scots Antarctic Expedition 1901. NEXT POST: 16th May 1915. Postcript to Letter of May 14th. Cadbury Mexican chocolate.Ember Days.Maconochie Stew.Symington's Pea Flour.The Hearkeners.The Listeners. 11TH MAY 1915. NEUVE EGLISE: TO SHAVE OR NOT TO SHAVE – TO SMOKE OR NOT TO SMOKE? 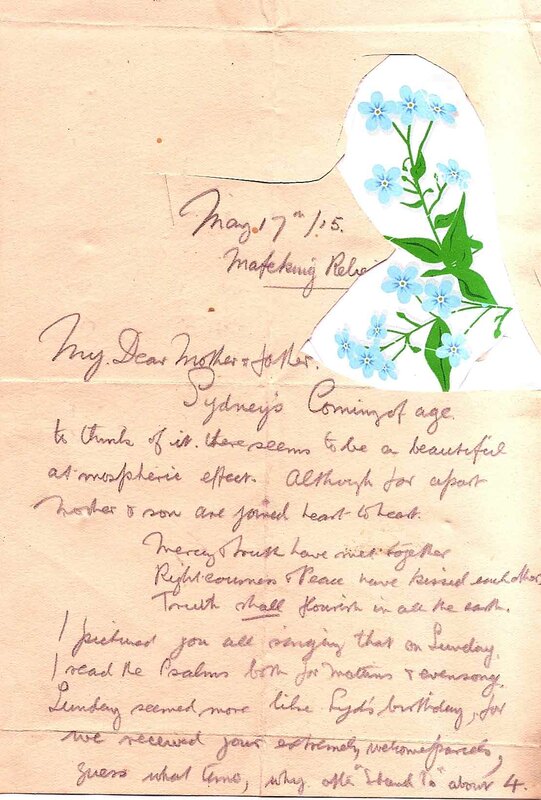 Pte BERTIE HIBBETT: LETTER to his sister IDA, 95, Foden Rd Walsall. I must really try & send you a ‘boomerang’ if I can put it like that. I mean your last letter was extremely homely & interesting & not only so, but long. Of course I re-read it again, then handed it to Sid & he has read it. Sid is writing to Harold. The evening today is glorious again, same as yesterday when we attended Church Parade in the field, within sound of guns & nature going on as usual. After the service our Colonel spoke of the Allies’ advance (2). The sugar– sweets & pastels are lovely. I thought they would last a long time, perhaps until we go into the trenches again, but they are so ‘nice’ they are going pretty quickly. You needn’t give up sending a little chocolate though Ha! ha! I had a little chat with Ford E, (Mother mentioned in her letter) – he himself is all right. I think it takes some pluck to be what he is (3). Don’t you think we have got a lot of patience? No self assertions, but we could tell you ‘lots’ if the censor would allow, but you see we can’t. Both sides must wait patiently until peace reigns once more. I guess Harold* is in lovely Yorkshire by now. Last night I made my 2nd attempt to shave. I mean a real attempt. I have lathered myself & just touched the razor before, many times, but on Sunday I started to shave. I persevered under the irritable persuasion & criticism of Syd & amid the friendly laughter of the OTC poking themselves round the hut. Well last night something told me not to shave yet a while, but rather answer your letter, but as things turned out I thought best to shave 1st & favour the Army. I was going on beautifully, lathered all my face & was about to make a stroke with my razor when – the alarm went. Syd will tell you that in his letter – (something like the fire alarm in schools). Well I left all my shaving tackle & fled – with the unfortunate result that I had to parade for kit inspection at 6 o’clock this morning. 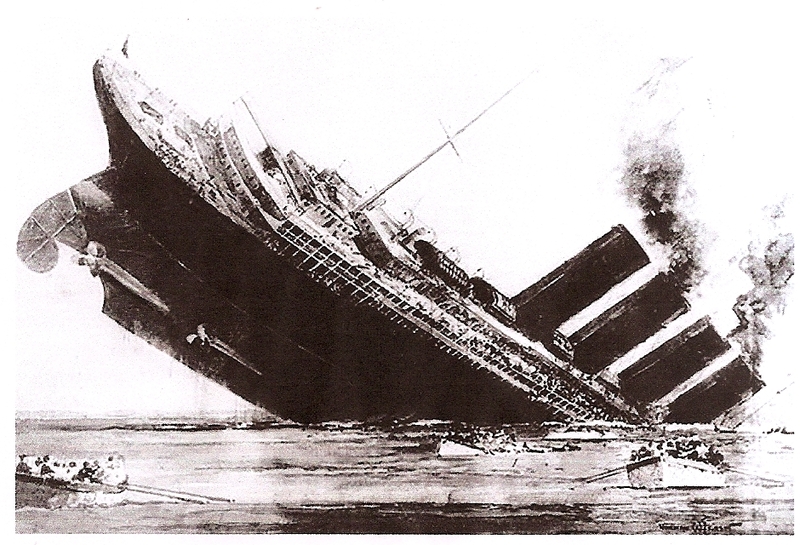 All of us out here know of the loss of the Lusitania (6). Lusitania. Sunk 7th May 1915. We wear respirators to prevent the effects of gasses. We have not yet come into contact with these asphyxiating gasses (7). By the by, talking about shaving, could you & Harold subscribe & send me a safety razor sometime? We can get spare time; very funny – we have more spare time in the trenches than in Camp, so if you send a Times now & again in your parcels it will not only serve as packing, but we shall be pleased to read the articles. I shall have to start a fresh page now! I have not smoked a cig. since I joined, but a stretcher bearer told me once that now the heat of summer is coming there are many different smells arising, as well as the gnats. I made a resolution not to smoke until I came back to Walsall at the end of the war. R.A.M.C Autographed Player’s Cigarette Papers. J. Whyte & Ernest C. Kirk. A.H. Hibbett’s Autograph Album. Red Cross Hospital. 1916. We get some cheap cigs often with the rations – ‘Roll Call’, (8) ‘Kitcheners’ etc, but if I start I will either have a good cig. with holder, or smoke a pipe. Now Arthur Brown* gave me a pipe. I should be less anxious if Dad would tell me his advice on the matter. Shall I start smoking or not? I come to the conclusion that I am not far off being the only chap in the Battalion, if not in the Division, who does not smoke. Arthur Penning* was a non-smoker until he came out to the front. I am looking forward to Dad’s photo as well as Mum’s & did Harold get his uniform? Good luck to Dodger. Do you remember Guy Butter (9) whom Mr E. N. Marshall* said he ‘admired his generosity’? – well it was his coming of age, last week. I guess you have seen more than one photo of some of our casualties in the Observer. Vernon & several men get the paper & I felt flattered to see my name in the Roll of BCS Old Boys let alone that of QM (10). Our friend Norman Cope* was upset somewhat with the exciting time we had last time in the trenches (11). Do you know that Mum wrote on Wednesday & Dad wrote on Friday. We got Mother’s first & then Dad’s. Lastly we got yours on the day between, the very day we shall never forget. If you come across anything in my letters to you or Basil that will cause Mother anxiety then read the letter out & miss those parts. Syd is getting favoured among the men, but he has to take his turn in doling out the meals, which is pretty rotten, you’ll understand. I will stop now. To Smoke or not to Smoke. The habit of cigarette smoking took off in the 1914 -1918 War (despite warnings about the dangers of smoking) no doubt mainly because of the appalling stench of the Trenches. My father thought he must be the only one in the whole Division (18,000 soldiers) who didn’t smoke – but ‘under age’ he felt it his duty to ask his father’s advice. It took him 40 years to give it up. Under the title Comforts for Tommies many Cigarette Funds were set up. (1) Post stamp ed 15th May ie when 1/5th back in the trenches. Censor W.E. Wright had to check carefully no one mentioned casualties & serious damage to Trench 8 on 6th May. (2) Allies Advance: Allies launched a joint offensive on Western Front on 9th May 1915 and the 2nd Battle of Ypres ended on 24th May 1915. (See Battle of the Western Front. The Great War 1914-1918 website). (3) cf. Post 9th May. (4) Captain Lister or Captain Wistance. (5) G. Wiley. Punch Archives. 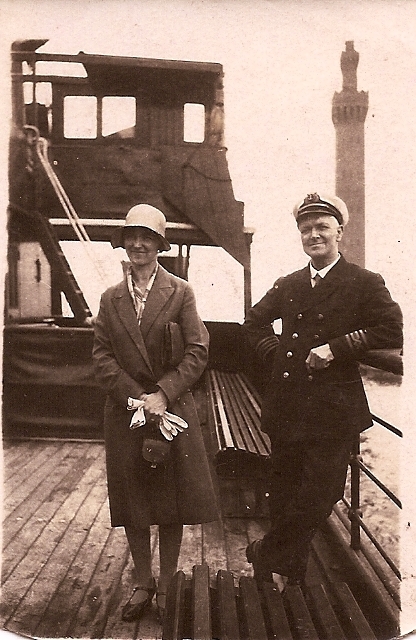 Chief Engineer F.A Goodison & daughter Madge Goodison. Grimsby 1930. NB Bertie Hibbett’s future father-in-law (my maternal Grandfather) Chief Engineer, Mercantile Marine, Frank Arnold Goodison, saw Lusitania go down; narrowly missed death himself from torpedo attack – received recognition for his actions. (7) cf South Staffords War Diary for 22nd April, Post 3rd May. (8) Cigarettes: ‘Roll Call‘/ ‘Kitchener’s‘. See The London Gazette Card Co. Ltd (Lord Kitchener’s woven silk issue, 1915). (9) Guy Butter QMS Old Boy? (info pending). (10) BCS: Blue Coat School, Walsall. QM: Queen Mary’s Grammar School, Walsall. (11) Shell Shock from 8 hours shelling. Welcome Page for May 1915. NEXT POST: 14th MAY 1915. The Listener’s Lounge. 7th May 1915, Fri: 2nd Howitzer Battery 46th Division shelled fortified house opposite Trench 8 with great effect about 10.am. 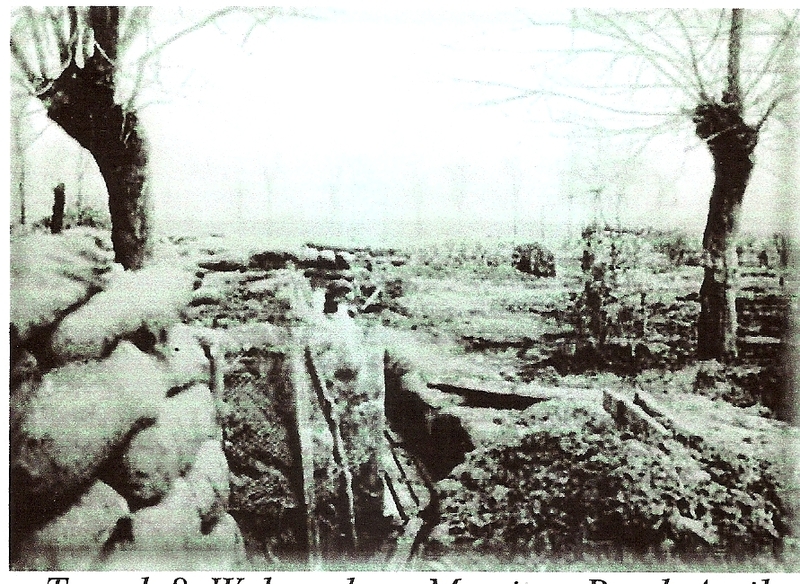 Enemy’s Artillery dropped 18 shells in & near Trench 10a making two breaches in parapet. CASUALTY: 2 Lt F. Wilkinson wounded while repairing wire entanglements in front of 10 b trench. 8th May, Sat: Enemy’s Artillery fired 40 shells at 10a trench and SPA and 4 shells at Trench 9 but without effect. 1/6th Souths relieved trenches. Lt Lamond 2 Bn The Royal Scots joined as adjutant. Pte BERTIE HIBBETT: LETTER to his FATHER & MOTHER, 95, Foden Rd, Walsall. What a dainty little parcel, so neatly packed. The sweets are lovely, just what Sid & I like and want now the weather is getting warm and sunny. Rather a cold wind blowing though this afternoon as I came out of the hut to write this letter in the field, so I took a seat in the corner of a trench which is in the precincts. My word, Mother, what a long letter you wrote & I did enjoy reading it. In fact I did what you did with our letters, re-read it. We came back to camp last night & on the 1st day after getting back we have 2 posts. On the 1st post I got the towel & sweets & on the 2nd post, which we got after dinner, Sid got Dad’s interesting letter. That’s why I have again addressed this letter to both of you. I was so glad to get another ‘epistle’ from Dad, (as Miss Foster calls a long address. I’m sorry for Capt. B. & for the Mayor but we OTC (2) could not help but feel amused on hearing of the kind of measles [they had]! I guess Harold is with you today, by what Mother said in her letter. It will be a pleasure for Mother to go to Bedale, I’m sure. 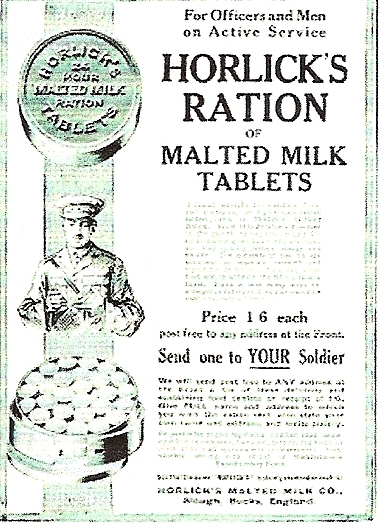 When you see him next tell him that those Milk Tablets seem to have had a rather dramatic ‘life’ (if I can put it like that). He had to keep the parcel waiting for them & when I got them they eventually got buried through the [action] of the enemy. I found them safely afterwards though & now the bottle comes in handy for my share of the sweets, which will last a long time. They are a change to chocolate which we have had so many times. Mother, you will be greatly comforted to know that Vernon, Sid & myself are not scratched even. We have been ‘through the mill’ this last time, – something like warfare. And Dad you will also be very pleased to know Sid is getting rapidly in the favour of some of the men, especially the OTC. One chief example being with regard to Listening Post (3) on which I volunteered with A. Brown*, Iky the correspondant*, & C. Jackson *of Counties Bank & another. It was on this post that we saw Ford E*. he has taken over a very responsible duty, let alone rather a daring job, he goes round corners with a revolver (4). I don’t think he or his Dad is frightened of a rifle. Vernon showed me a PC of his sisters in uniform taken with several other Red Cross people (6) & he also mentioned that his mother had paid you a visit. Ida was the only one in & as they were going home they happily met Mother & Dodger. I’m afraid I was not such a brick as Sid was when I had my teeth out for it was like ‘sitting in a rose bed’ compared with the ‘Tug of war on just a wooden chair’ with Sid’s teeth (7). At any rate I am grateful that Sid has no more pain now. Talking about photos, both of us will be looking forward to seeing Dad’s – & I am anxious to get a photo of Mother as well. I have got one of you all round the tent. The one where I am standing up with my arms at the back of my head & Ida smiling up. Abergele, Wales. 1914. Bertie, Hilda Bore (Harold’s fiancee), Basil, Ida. Seated behind: Mother and Father. (Photo taken by Harold). You all seem to have a kind of ‘prophetic countenance’. I should very much like one of Mother close to. As for Sid’s forget- me- nots- he told me he had forgotten the forget-me-nots! Now ain’t that funny Mother, – however could he forget a forget-me-not ! I guess all his memory was concentrated on the real forget-me-not i.e. you Mother. I will try to get you a root & send it off to you sometime. We have had no service so far today. I expect we shall have it tomorrow. Oh! – just like me leaving it to the last minute – I had a lovely wash & wipe with your lovely white towel. On coming back I saw we had got a real rig out for washing – enamel basin and stand. Well Ta Ta for the present. Best of love, Bert. PS Sid’s birthday will be on Monday next (10) We shall in all probability be out of the trenches on Sunday. night 16th. Parcels take 3 days about so if you send one, send it on Friday 14th & it will be likely to arrive in time. PS Alan Machin* specially told me that he wished to be remembered to you both, Father & Mother. He is still keeping well. Monday: Just got a letter from Ida which I expected & now thank her – will get another reply bomb ready soon. ‘Through the Mill -something like Warfare‘ Typically Pte Bertie Hibbett makes sure he reassures & thanks his parents for their parcels &letters before he mentions his ‘exciting times‘. (1) Rogation Sunday: ‘Beating the Bounds‘ is still practiced before Ascension Day, when priest & congregation process around the parish, stopping at boundary stones, trees and farms to ask God’s blessing on fields and crops & for ‘God’s mercy on all creation’ (from Latin rogare -‘to ask’). (2) ‘We OTC’ : Pte Bertie differentiates himself & his QMS pals from other volunteers. His parents expect their sons to take commissions in due course..
(3) Listening Post: a very dangerous duty out in No Man’s Land, for which my father & his QMS pals volunteered from their first day in the trenches at Armentiers. See Posts for March 1915. In My Memory of the First World War 1967, my father, writes: I shall never forget my experience at Neuville St Vaast, for it was there that I went with a party underground to listen for the enemy tapping their way in underground passages towards our Front Line. It happened one dark night which made it all the more ‘exciting’. Whose mine would go up first, theirs or ours? Our feelings were indeed tense. “Pass the word down for Bomber Ford”, came the command from the officer in front of our column, as we lined up to throw hand grenades over the parapet. “Pass the word back I aint,” retorted Bomber Ford from the rear. The German mine went up first – and we tried to occupy the crater before the enemy advanced to take possession of it. The Revd A. H. Hibbett, 1967. (4) Training in Underground fighting for Tunnellers/ Sappers/bomb layers. (5) Wisemore Schools were erected in 1883 in poor districts of Walsall/ St Matthew’s Ward, once the location of Ragged Schools early 19th C. Average attendance: 328 boys, 305 girls and 316 infants. See Town End Bank at the Wisemore, John Griffiths. The Local History Centre, Essex Street, Walsall has the registers. See also The Story of Walsall Education – Wolverhampton History & Heritage – useful photographs of school buildings. <www.historywebsite.co.ukarticles/walsallschool.htm> See also Menu Page: 1925 Walsall Observer article on my Grandfather, Arthur Hibbett’s Retirement as Education Officer. (6) Red Cross photos pending. (7) Army Dentists: no dentists at the Front at beginning of war. Both Pte Bertie Hibbett & L Corp. Sydney Hibbett had to endure ‘rapid extraction‘ with crude instruments (as found in dental practice in some African countries today). 12 dentists were attached to Casualty Clearing Stations (after Sir Douglas Haig got toothache in France!) Ambulance Cars began to be used in 1915 & in May 1916 a Mobile Dental Laboratory was given to the Army in by the Civil Service Ambulance Fund through the British Red Cross. PS You remember the blankets you sent us & when we got to Luton after Home Leave we found new ones for us – well we have just been issued with towels. We go to the baths the day after we leave the trenches. I am keeping the new paper you sent for a letter to Mrs Jones. I think I ought to write a combined letter. I sent Field PC but Mrs Jones seems to treasure a letter from the Front. Did you, Mother have a pleasant hour that Monday afternoon? Oh Sid & I would be delighted with a small pot of Mother’s brawn, the parcel only takes four days at the most to come so the brawn will keep fresh & Ida could send some pineapple chunks for tea. With best of good wishes to harold & Miss Bore & fopndest love to you both dear Mother & Dad. PS Keep this letter & when I come home I will tell you what a time I had in writing it. God save Our King.